Parenting tip for shaping our child’s disposition. Children get their behavior from us; if you do not like something your child is doing, first look within. “If there is anything that we wish to change in the child, we should first examine it and see whether it is not something that could be better changed in ourselves.” (Carl Jung, quoted in Secrets of the Baby Whisperer, page 251). Ezzo and Buckman call it gaps in parenting. Hogg refers to it as accidental parenting. It is the notion that often when the child is misbehaving, the root of the problem can be found with something the parent is doing wrong. I mean, that sounds harsh. No one wants to think that a problem stems from them. However, recognizing and admitting that helps you move on to the good news. The good news is that you have full control over fixing the issue. I personally have found this to be very true. I haven’t kept track, but I would be willing to say most of the behavior problems I have encountered with my children have been my own fault. Perhaps it is that I let Brayden watch more TV than I know he can handle without misbehaving. Maybe a nap didn’t go well because I let one or the other stay up a little longer than I should have. I have often found I have allowed a child too many choices or freedoms, resulting in that child thinking he is deserving of more than he actually is and can tell me no. I love this quote from Carl Jung. If (when) your child has a behavior problem, you will solve it most quickly if you first look within yourself and figure out what you are doing wrong. Yes, this takes humility, but you must get over yourself. I am pretty sure parenting is a quick cure for pride in anyone who thinks they are always right and can do no wrong. If you haven’t gotten there yet, get there. The faster you identify what you are doing wrong, the faster you can correct the behavior problems you are encountering. This quote can also be applied in another way. As your baby turns into a walking and talking toddler, you will start to learn the quirky phrases and gestures you make in an exaggerated way. Brayden has picked up on something my husband or I do that neither of us realized happened. They watch every move you make and look to you as an example. When Brayden was a toddler, my husband and I realized we say the word ‘stupid’ a lot. It might not sound so bad coming from an adult, but once your three year old starts saying it, it doesn’t sound so cute. In fact, it sounds quite offensive. How did we fix it? We told Brayden we shouldn’t be saying that word, it isn’t a nice word. Mommy and Daddy wouldn’t say it anymore and Brayden shouldn’t either. No problem. We are both happy we are not cursing people. When you make a mistake, there is no harm in explaining to your child that you have made a mistake and resolve to do better. I don’t think children need to think their parents are infallible. Young children (since that is my experience) are very accepting and forgiving. They don’t hold it against you or rub it in your face. Also, it shows them an excellent example of how to apologize and make things right. You are the only person you can control. Yes, you can and should guide and teach your children, but when it comes down to it, you cannot force them to do things. So the fact that most behavior problems are rooted to actual parenting problems, this should make you feel much better about the situation. You can change yourself. You can change your behavior and actions. 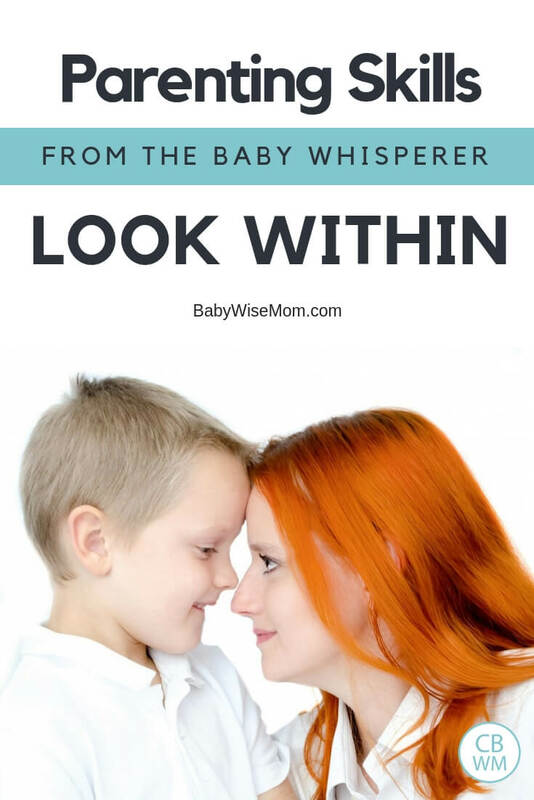 Get your copy of The Secrets of the Baby Whisperer here. Good post! I have read the baby whisperer solves all your problems and I could see things that I needed to change and I hope that this concept sticks with me for all my children.Might I add too though, that with the emotional changes after birth-don’t fall prey to the “bad parent” syndrome either.Too many times he would be crying trying to fall asleep when I missed the window for putting him down for a nap and I would be crying myself-because I felt bad for putting him down to late.As long as you know you are trying to do your best, don’t feel bad if you don’t get it right all the time. That can also create a bad habit. I would put him down late, feel that it was my fault- “he is crying because of me” thoughts and then I would go in a rock him to sleep-creating more bad habits.Children are sent to us to take care of, to help us learn to love like God does. We aren’t expected to be perfect, just learn as he learns too. Great post…and so true! It’s so interesting that you decided to post about this as I’ve actually been thinking a lot about this very thing of late! Good point, Lorri. You can’t (and won’t) be perfect and will make mistakes; you must forgive yourself when that happens!